After completing my son’s Dr. Herman I was still in the Herman zone. 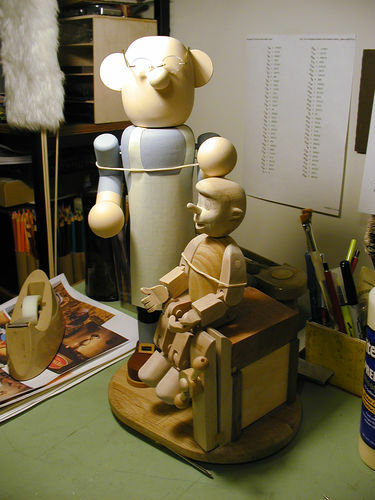 I started to design another one along the line of the Dr. Herman but it eventually turned into a Pinocchio – Geppetto project. I’ve been a Disney fan for years and thought it was time for a Pinocchio Herman set. I started with a standard turning of the main character parts on the lathe. 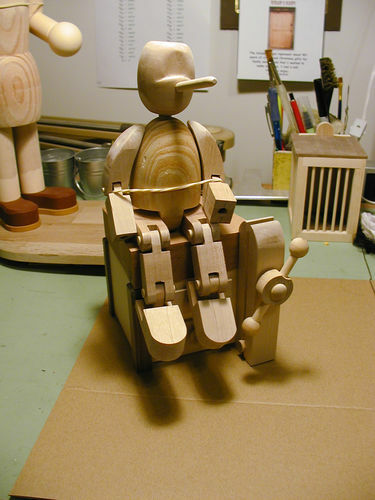 Then started working on the Pinocchio doll itself. It had to be segmented just like a puppet would be. I drew it up to scale with the Herman character which will eventually be the Geppetto character. 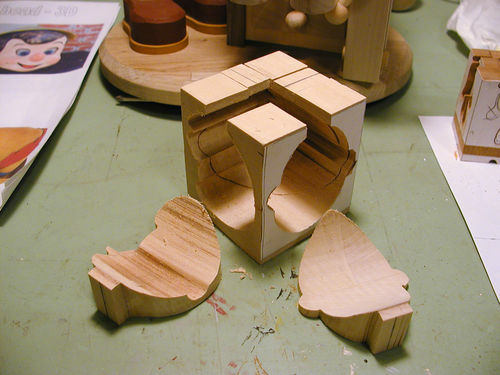 Once it was ready to transfer patterns and cut it out on the scroll saw I had trouble with the joints not holding up to bending without ruining the wood. 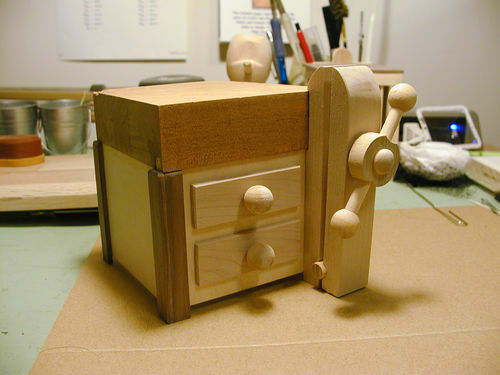 I realized I needed a harder, yet workable stock so I went to maple instead of the mahogany I started with. Those joints withstood the bending and cutting better. 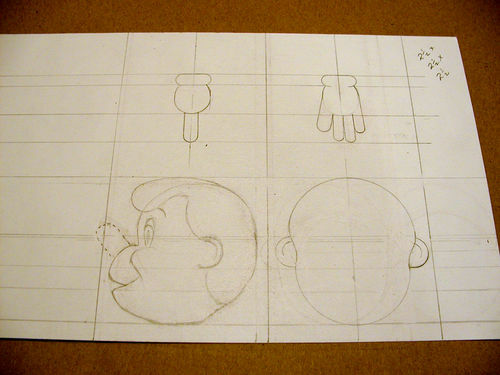 I didn’t like the head I started with because it wasn’t rounded in the right places to resemble the Pinocchio head I had pictures of. So I tried clay… I’m NOT a sculpture and the head looked more like Dopey from the 7 Dwarfs instead of Pinocchio. Next I’ll try carving one from balsa I guess. 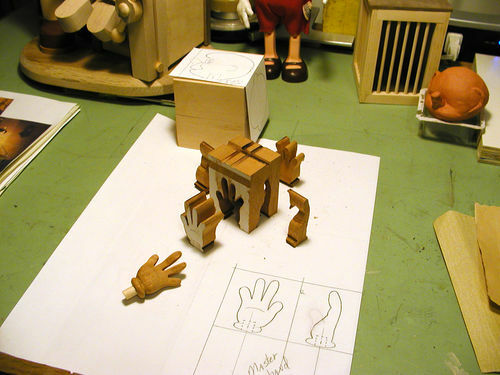 I might try the Balsa for the hands too. 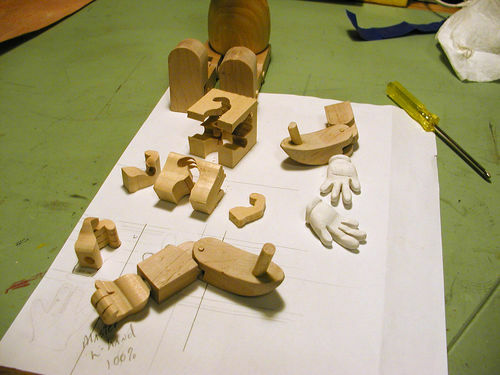 Cutting out hands with joints similar to the arms and leg joints might be detrimental to my own fingers at this point. 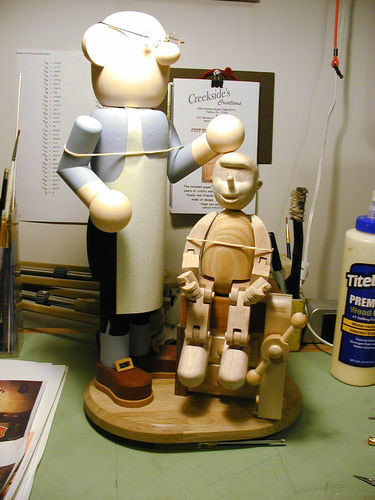 This pic shows the main character which will eventually become Geppetto and one of my previous Herman Nut Crackers for size comparison. 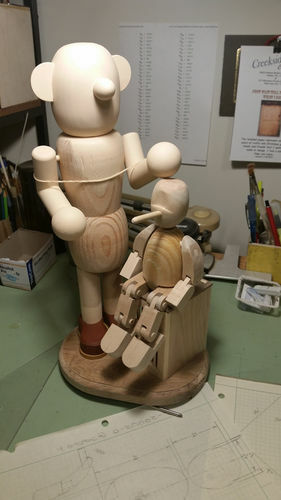 Because of the size needed for Pinocchio to sit on the workbench, my standard base dimensions had to be extended by 1” on the length and 1/2” on the width. I’ll keep posting updates as I get into the details of the head and hands progress. I brought in my chair for this one, front row Please! Going to be so nice!!! Wow! Now that some true artwork there. I’m just blown away. I’m with Bruce on this one. Found this downstairs in one of the boxes of stuff the grand kids play with. Forgot I even had it. The head is almost the exact size I need… went out and bought some blocks of bass wood to try to carve out the head and hands like i had mentioned in the original blog entry. Hands are a bit small but still give me the idea of how they should be shaped. I don’t promise anything on the first try… never did carving before. 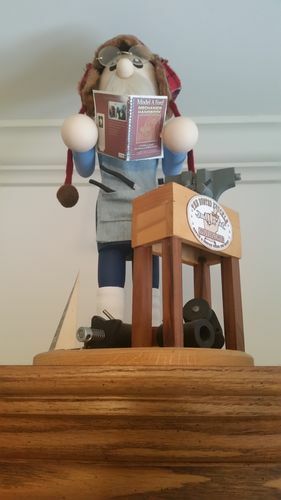 Thought I’d share some images of the other “Herman” nut crackers that started this whole thing. 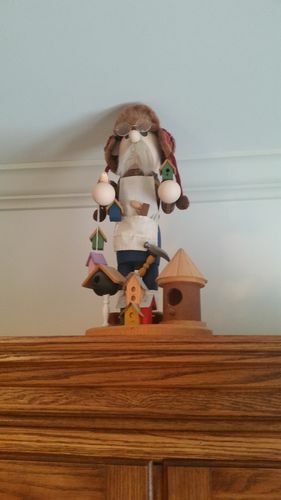 This is Herman the Birdhouse builder. 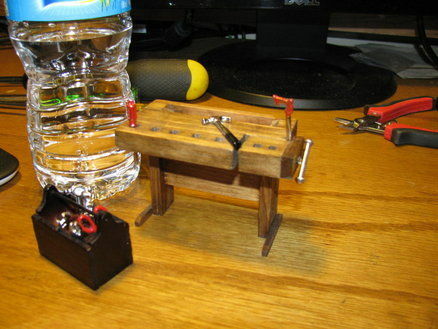 I did this one while I was working on my Model A Ford truck. 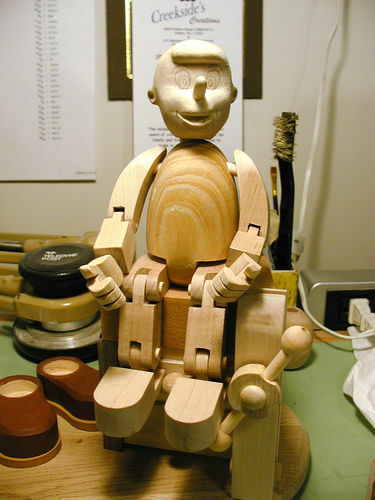 This is Herman the Toy Maker before I added the moustache. 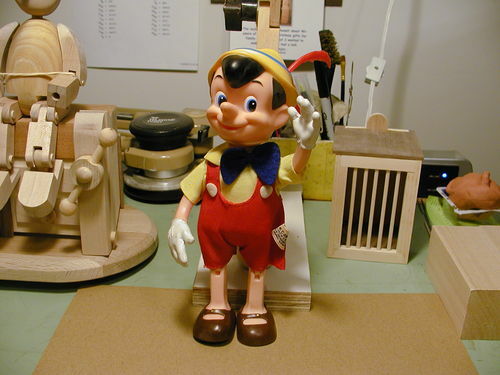 And this is the last one I made before I started Pinocchio. 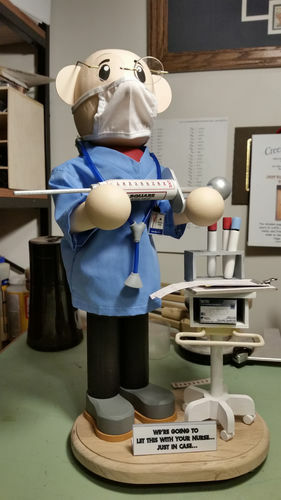 It’s my son’s Dr. Herman. So nicely done. Way Cute!!! Like I said I never tried carving before but it makes sense to start with a rough cutout of the head first. This is the type of pattern I used to make scroll flowers and multiplane pieces from a square or rectangular stock called a combination cut. Ignore all but each outline of the pattern I only added the detail so it would help with the scaling of the head. You attach it with pattern glue or I used 3M 77 (folded at the line separating the two images (views) to the stock (2-1/2×2-1/2×2-1/2 in this case). Then cut out the profile view first. Tape it together and then cut out the face view. You should get a basic head shape to finalize with a Dremmel or rasp files. 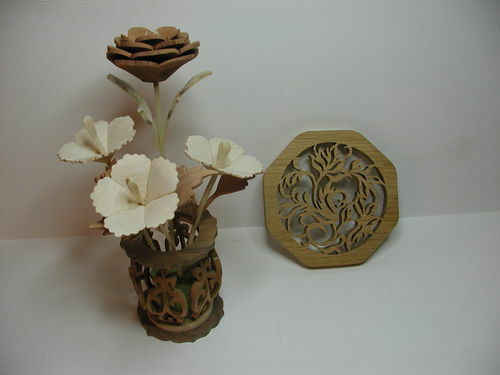 This flower vase and flowers are the result of ‘combination’ cuts. Now I need to enlarge the Basswood blanks I bought because they’re only 1-3/4×1-3/4×4. Drew up the compound cut for the hands today. Thought I’d try that before attacking the head cutout. May have to reduce the head somewhat because of the thickness my scroll saw will cut with out hitting the arm against the stock. It shouldn’t hurt the proportions. I can go down about 10% from the original pattern. I reduced the hand size twice in the pattern before coming up with the size you see above. Any smaller would have been a bugger to cut safely. What you see is the sections that come off after you do the two separate cuts in the stock. All the pieces by the block come out and the hand you see in the foreground (after a little sanding and filing) are what’s left inside the block. A little more smoothing and painting them white are all that’s left to do on the hands. OK…didn’t like the other hands. Redid them this morning after redrawing them last night. Like these much better. They don’t look like Pinocchio just sat on a tack. Might even let them a little rough instead of smoothing them off and painting. Keep up the great work loving it!!! Got time to cut out the head this afternoon while the Grandkids were destroying the basement. Every now and then one would wander into the shop just to see what I was doing. Then they started to go through my boxes of scraps to find “stuff” to make things of their own. Cool… If only they keep that creativity and curiosity. Some of my ‘work is done’. Head ‘sanded’ but no detail painting yet. Can’t say I really ‘carved’ it because the three tools I used the most to form the head was the scroll saw, a small orbital sander and a mini-detail sander. 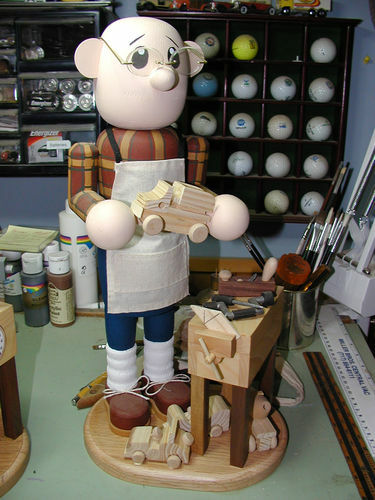 I’m more satisfied with this head than the other so the Pinocchio wood working is done. Now on to the Geppetto nut cracker. Not too much wood working left on t either. Just a tweak here and there before going on to the painting detail on both and making the leather work apron. Probably some hand tools too. Much more detailed and proportional. Cudos! I tried to keep mine more whimsical like the characters them selves. Not sure my hands would let me be that detailed anymore at that size. Cool..
Down to painting and finishing gluing stuff up now. 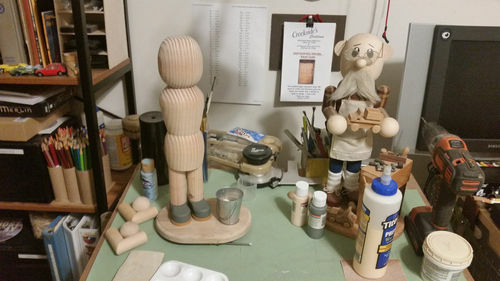 Started on Herman – Geppetto yesterday. Probably work on it most of today since going any where in this weather would be nuts. May have to go ‘treat’ the satellite dish.. running a bit slow too. Front view of Herman setup with apron pattern on for size. Have a nice piece of soft leather to use that I got from the craft shop a couple years ago. Front view of Herman himself showing apron placement. 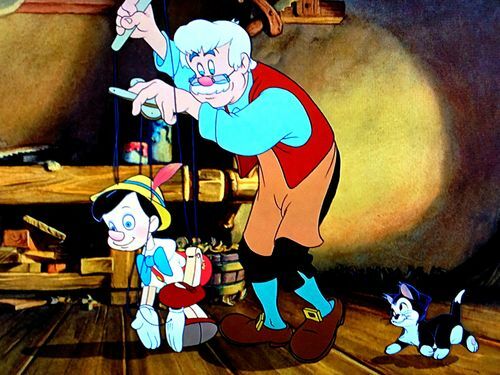 Pinocchio is pretty much where he will end up in the end. Hands glued in position and arms too. Work bench also glued to base after sealing it yesterday.